Sitting peacefully within the Quinta Vista Alegre estate in a residential area of Funchal in Madeira, Funcho Cottage is a beautifully-restored cottage with plenty of character on offer. Sitting peacefully within the Quinta Vista Alegre estate in a residential area of Funchal in Madeira, Funcho Cottage is a beautifully-restored cottage with plenty of character on offer. The cottage is surrounded by banana trees and vines, creating an atmosphere of exotic tranquillity. There's a sense of history and romance throughout Funcho Cottage. It exudes traditional charm from having retained its original, stone walls, as well as featuring select pieces of furniture crafted from wood found on the estate. Cosy, comfortable and set within idyllic grounds, this villa provides a total escape from it all. Funcho Cottage's characterful accommodation is all on ground level, making it easy to get around and to walk straight out into the beautiful garden. Enter the villa directly into the open-plan living/dining/kitchen space. In the lounge area is a comfortable sofa and two armchairs for snuggling up and watching films on the television in the evenings. The dining table is perfect for intimate dinners and is ideally located by the well-equipped, corner kitchen for easy serving of meals. It's also positioned to make the most of the sweet-smelling breeze as it flows through the entrance door and into the villa. The restful and tastefully furnished bedroom features a king-size bed, a fitted wardrobe and ensuite bathroom. A convenient extra feature is the separate, shared laundry room with washing machine, dryer, ironing board and iron. There's a patio to the front of the villa, with the shared seating area being a lovely place to enjoy drinks or meals under the shade of the vines. The highlight of the outside space is the large swimming pool, which is set within an attractive terrace that's also home to a selection of sun loungers. It's the perfect spot to simply unwind and soak up the quiet and laidback feel of the area, whilst also appreciating its natural beauty. Funcho Cottage is a dainty stone cottage, which has been refurbished from historical Quinta Barns. 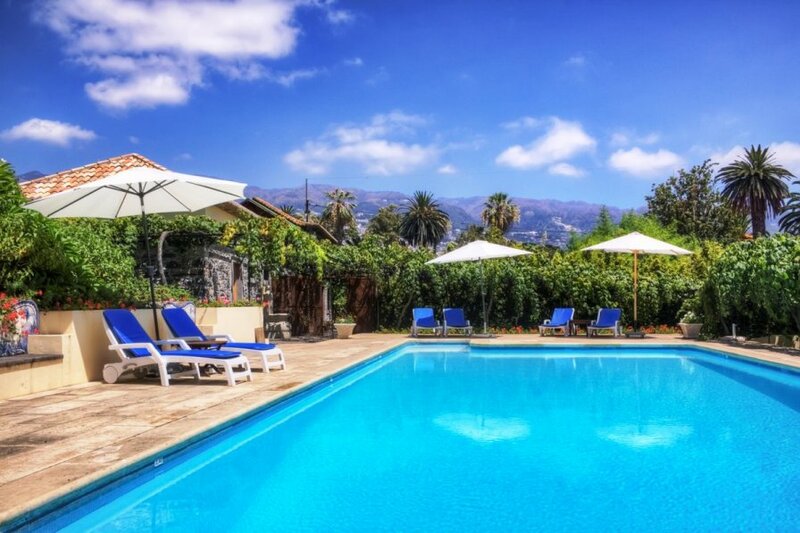 This holiday home, along with Bom Dia Villa and Fennel Cottage, are nestled within a historic banana plantation and within walking distance of plenty of amenities within Funchal. Funcho Cottage is a sweet 1-bedroom holiday home, which overlooks a communal swimming pool and lounging area. This is an ideal couples retreat, where you can cuddle up at night and relax in one-another's company. Funcho Cottage is located in one of the most enviable areas of Funchal, with plenty of amenities close by. A restaurant and a bar are less than a five-minute walk away, meaning it couldn't be easier to head out for an evening meal and drinks. Jump in the car and you'll find an even wider range of restaurants, bars and cafes within a 10 minute drive. The harbour at Funchal is always a lively place to visit – and you'll find plenty to see and do here. There's the CR7 Museum that's dedicated to probably Madeira's most famous football player, Cristiano Ronaldo, and a small casino for whenever you fancy a flutter. For a dose of history, visit 17th-century Sao Tiago Fortress. This impressive building is also now home to a contemporary art museum with Portuguese works on show. Make sure you sample some Madeira wine as you stroll around the city's characterful and colourful streets. You can go on a tour and enjoy a tasting at well-known Blandy's Wine Lodge. Another must-visit is the old town, or Zona Velha, as it's referred to by the locals. Here you'll find a network of narrow, cobbled streets that are lined with old buildings. Many of these are churches, with 15th-century Corpo Santo Chapel being one of the oldest and prettiest. Funchal is famous for its beautiful botanical gardens, with Madeira Botanical Garden being one of the most popular to visit. Also enjoy a scenic cable car journey up the mountain and then stroll around the sprawling Monte Palace Tropical Garden with all its exotic plants.